There have been some very high spring tides this week. At low tide, wading birds feed in the sand and mud of our estuaries and are more or less invisible. But at high tide they are forced onshore by rising waters. During the hour or two their feeding grounds are inaccessible they tend to rest and sleep, and can be quite approachable. This is particularly the case in autumn, when large numbers of juvenile birds are pausing on their long migratory journeys southwards. They seem to have less fear of humans than their parents. So on a visit to the high tide roost at Ynyslas, mid-Wales, on Wednesday I took advantage of these conditions to get some close-up images. Ornithologists these days all seem to have telescopes and their preferred method of bird-watching is to stand well back above the tide-line and watch the birds as they arrive. This allows reasonably accurate counts to be made and population trends can be identified over a period of years. Photographers prefer to be nearer the action, and we do run the risk of flushing the birds from time to time as we attempt to get that bit closer. There is a certain amount of tension between the needs of one group and the other. So I let the birders do their counts before edging closer to the birds which were resting amongst areas of cobbles on the beach. Over a period of time I gently approached them until the nearest bird was less than five metres from me! At first they appeared to be absolutely exhausted. They nearly all had head beneath wing and I watched one dunlin’s head and beak visibly drooping is it nodded off. Gradually they become more active and preened, stretched their wings and chattered amongst themselves. It was marvellous to be up close and this personal with these delightful wild creatures. One doesn’t know how much one’s own presence affected their behaviour. Were they excited to see me? It’s impossible to know. When the time came for me to leave, however, I just stood up and walked away without disturbing them in the slightest. I had been completely accepted by them. As it happened the bird that remained closest to me was a curlew sandpiper. This species is very similar to a dunlin but a little taller and more elegant. There are minor plumage differences in autumn but the white rump is distinctive. 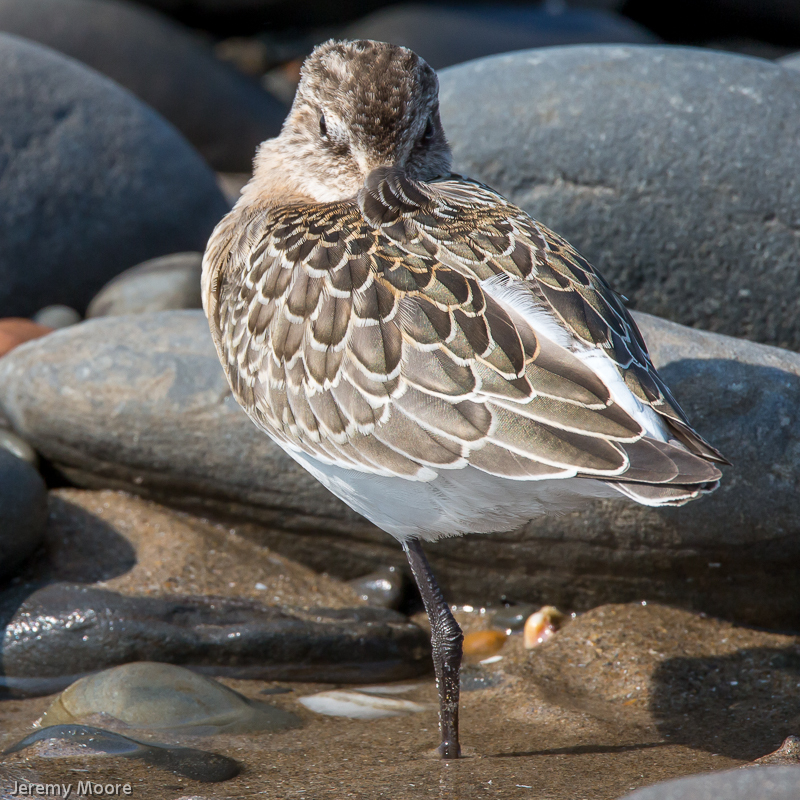 It is an annual passage migrant to our shores in small numbers and is usually found amongst large flocks of dunlin. It can provide quite an identification challenge unless one is quite close; in the picture above the white rump can just be seen between the folded wings. This entry was posted in Uncategorized and tagged bird photography, curlew sandpiper, juvenile birds, wader migration, wader roost, wading birds. Bookmark the permalink.